The Mystic Rose Facilitator Certification Training is an in-depth exploration of the transformative quality of this unique and wonderful process and an empowering transmission on how to lead this group. It is booked in addition to the Mystic Rose group. Becoming a Mystic Rose Facilitator is a unique and personal journey for each trainee. It is an exploration into pure essential energy work at the deepest level. Learning not only how to free your own blocked and repressed energy but also how to support the expansion and healing of others within the dynamics of Laughter, Tears, and Meditation. As a facilitator, you will also be a participant within the process. In this way, your understanding and insight will develop from within. In the first week of Laughter, you will learn how to communicate and facilitate this innovative process in a clear, professional and loving way. The introductions to each week are of great importance in allowing others to understand how best to work for themselves within this profound process. Develop the understanding of the energetic/emotional body; it’s release of energy blocks within our psyche through the dynamic flow of laughter. The importance of playfulness and humor in our daily lives and what the effects of prolonged laughter has on the physical body as well as the psychological and spiritual dimensions which are deeply transformative and healing. In the second week of Tears, we focus on the understanding of how we have accumulated so much pain and sadness in our lives through conditioning and trauma and why our tears, fears, and sadness have been so repressed. We will also develop the capacity of how to help others through these blocks by supporting deep abandoned crying. Releasing this stagnant energy will invigorate and liberate them from repression into expansion and freedom. A great capacity for empathy and compassion naturally arises in us during this touching and heart opening experience. The third week: Watcher on the Hills – Silent Sitting. In this week we relax into silence. The training will give you methods of how to deepen your own meditation and help other to experience glimpses of No-Mind. The importance of this final week is also how to help integrate meditation into daily life. This training is a transmission of Leela Itzler’s 28 years experience of participating, facilitating and training thousands of people around the world in this amazing life changing process that Osho has created for us, and it also reflects on the many years of experience of Indivar Gerald Bronstein M.D. and Chaya Mueller Bronstein in facilitating this process. They are certified Mystic Rose facilitators and senior facilitator trainers. What Is the Secret of the Mystic Rose? Man is born as a seed. To accept the seed as your life is the greatest mistake one can commit. Millions of people are born as seeds, fresh, young, with tremendous potential of growth. But because they accept the seed as their very life, they die as a rotten seed; nothing happens in their life. The symbol of the mystic rose is that if man takes care of the seed that he is born with, gives it the right soil, gives it the right atmosphere and the right vibrations, moves on a right path where the seed can start growing, then the ultimate growth is symbolized as the mystic rose – when your being blossoms and opens all its petals and releases the beautiful fragrance. Unless you blossom into a mystic rose, your life is nothing but an exercise in utter futility. You are born unnecessarily, you are living unnecessarily, and you will die unnecessarily. Your whole biography can be reduced to a single word: unnecessary. But if you can blossom and release that which is hidden in you, you have fulfilled the longing of existence. You have given back to existence the fragrance that was hidden in your seed. You have come to fulfill your destiny. The mystics have never accepted man as the ultimate product. Man is only a beginning and one should not die as a beginning; that is ugly, insulting, damaging to your dignity. Man should reach to the absolute fulfillment – not only for his own contentment but for the contentment of the cosmos. That is the secret of the mystic rose. Yes, in a few traditions the mystic rose is also called the magic rose. Both words are meaningful. It is certainly magic when you see within yourself the blossoming of the rose, the beauty of it, and the divinity of it, and the truth of it. You cannot believe your own eyes. You have never dreamed that you contain so much, that your potential is so valuable, that your interiority is a treasure inexhaustible, that you need not be in debt to existence forever. You can return to existence a millionfold what existence has given to you. That moment is of great joy, not only on your side but on the side of the whole cosmos. The No-Mind Facilitator Training is an in-depth exploration booked in addition to the group. Becoming a No-Mind Facilitator is a unique and personal journey for each trainee. It is an exploration into pure essential energy work at the deepest level. Learning not only how to free your own blocked and repressed energy but also how to support the expansion and healing of others within the dynamics of Gibberish and Meditation. Osho’s unique approach to meditation. The rule of the facilitator and how that differs from the role of a group leader. Setting up the group as a safe place to let go totally. How to encourage people to go deeper. We will learn and practice giving instructions each day including instructions for after the group. Finding the right meditation or group for a person. Layers of the mind – emotional, mental, physical, energetic. Review of what happens when no mind happens. New perspectives on life -changes in job relationships and activities. The training will give you the ability and confidence to set up and facilitate the No Mind Group in a safe effective and loving way including aftercare. 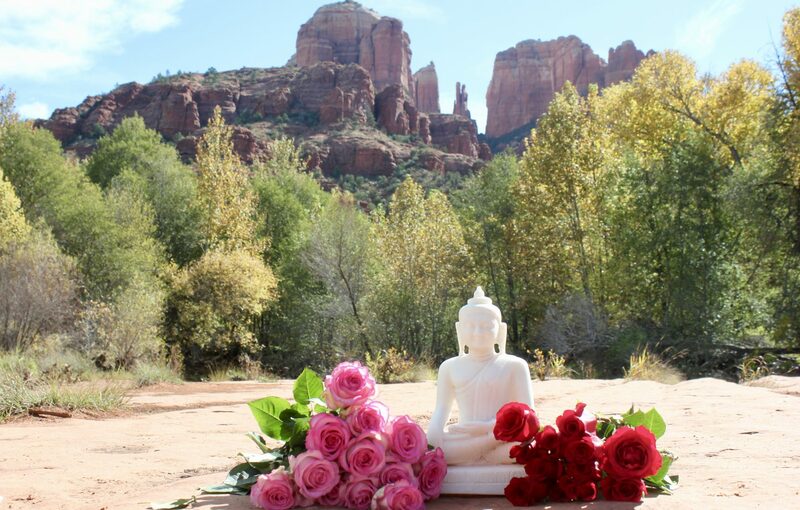 Our next No-Mind Group and Training is in beautiful Sedona, Arizona January 19th-25th, 2019.